PASAY, Philippines — They may be named One Direction but the pop boy band is heading to stadiums everywhere as they continue their unstoppable success with their “On the Road Again” tour. One Direction thrilled their fans in the Philippines during two recent sold-out appearances at the 20,000-seat SM Mall of Asia open grounds in Pasay, with audio for the concerts provided by Manila tour sound contractor SoundCheck and a HARMAN Professional system featuring JBL VTX line arrays and Crown I-Tech HD Series amplifiers. SoundCheck was a logical choice for the events, having provided live sound reinforcement for previous SM Mall of Asia shows and other major concerts and artists in the Philippines for more than 20 years. 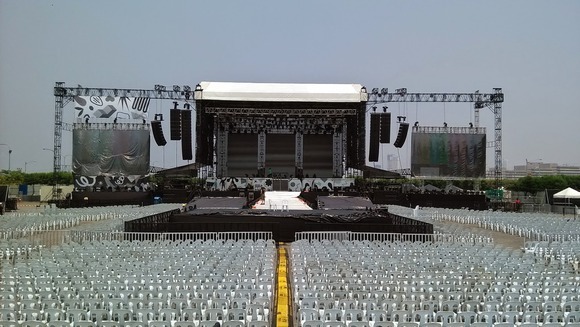 The One Direction system featured 16 JBL VTX V25 line array elements per side for the main PA. The main PA system was configured to deliver plenty of low-frequency SPL, thanks to eight VTX S28 subwoofers hanging. An additional six S28 subs and six JBL VERTEC® VT4880A subwoofers per side were all ground-stacked two boxes high. Another set of eight V25 loudspeakers on each side at 35 degrees off-axis was set up for the out fills. Eight V25 loudspeakers on each end of the stage provided out fill and eight JBL VRX932LA Constant Curvature cabinets handled front fill. Two stereo sets of delay towers with 12 V20 loudspeakers per tower completed the system. Crown I-Tech 12000HD amplifiers powered all the V25 line arrays and S28 subs, while all the V20 arrays were driven by Crown I-Tech 4x3500HD amps. JBL HiQnet Performance Manager™ software was used to set up, calibrate and control the entire system. Soundcheck had used the VTX and Crown combination with great success in the SM Mall of Asia before, and knew it would deliver exceptional sound – and overcome the high noise level of 25,000 screaming fans singing along to every word. Since adding VTX and I-Tech to the company’s inventory Jaime Godinez, Owner and Chief Engineer of SoundCheck, had come to more and more appreciate the system’s ability to deliver output, coverage and intelligibility far better than that of previous – and larger – line arrays, with a more even tonal response throughout the speakers’ coverage area. The sound system of choice was initially in question, but having pushed for the VTX system, Godinez naturally was more than a little curious to find out how the artist’s system tech and sound engineer would feel about the system. “They got in and heard the setup well before show time and they were pretty happy that we had already had the whole system aligned and ready to go,” noting that JBL Performance Manager, their previous experience with the venue and the VTX’s rigging-friendly design made the setup process relatively easy for them.